During the last month, I took part in two walking exchanges with Blake Morris, post-doctorate researcher and one of the founders of The Walk Exchange, who is nearing the end of his A Wander is not a slog project. This involves completing all 54 of the walks in Clare Qualmann and Claire Hind’s “Ways to Wander” book, itself a collaborative effort collating walking scores from around 50 different walking artists. Our responses, authored jointly, are published on Blake’s blog here and here. In this meta-post, I am reflecting on the experience of the walk exchange and adding a little more detail to my responses to the walks. Blake lives in London, and I live in Shrewsbury, and for various reasons of cost, available time and convenience, we did the walk remotely in our home locations, but used a combination of phone calls, SMS text and email to share the experience in real time and retrospectively. Our responses were gathered together quickly within a day or so. The walk itself did indeed feel like a shared experience, and the self-imposed time restrictions added a sense of urgency and intensity. The need to share and reflect on the experience heightened my attentiveness during the walk. There were many possibilities for making the exchange using digital technologies, and we could have opened out the event to more people. Indeed, Blake has done this with some of the walks in the project. A walk in four sections in which we explored the town as an urban performance space in which movement and relationships are considered to be choreographed. I observed the human, non-human/inanimate participants . It was as if, each has a multitude of tiny filaments which continuously latch onto other agents and unlatch as connections form and dissolve. In the first part, we were encouraged to identify discrete “performances” and to determine their conclusion – so considering the scope and duration of performance. In doing so, one quickly notices the overwhelming stream of details, movement and interconnections that are going on at any one time. In the second part, we focused on one interconnection, which we decided would be between “an inconsequential thing and a tree of consequence”. Of course, under the gaze all things, however ephemeral and inconsequential, gain gravitas. I walked between a water hydrant, connected to Conduit Head, a historic water supply to Shrewsbury since Tudor times and a horse chestnut tree in St Alkmund’s graveyard. Although this is in the busy centre of town, the route between follows narrow shutts or passages in which one is forced to experience the town more by hearing and smell than visual observation. I reflected on my two things tied, gripping into the earth linked by dog-legged pathway, a connecting path burnt into memory, the space holding an invisible thread in perpetuity that only I can sense. The third part was about following and participating in the performance. Keen to avoid following people, fraught with questionable ethics, I went to Doctor’s Field on the edge of Shrewsbury where cattle and horses are often kept on grazing land. Ironically, however, I almost immediately needed to hurry past a woman to avoid an awkward moment. Finally, returning to the place I finished my walk (i) in the morning, I stayed still to explore my visual frame. Over time, the visual gives way to other senses, but I also gain a greater sense of the overall pattern of movement within the frame. A frame which at its extremities includes deep blue sky, structural cabling high above the concrete pedestrian footbridge before me, and footpaths stretching away to my right and left. My feet are planted on stone paving, obstructing my contact with the earth. I begin to map the rhythms, character, scale, speed, direction, proximity of the different types of movement, noticing that in the urban terrain, these are dominated by human structures and routines. These repeated movements are choreographed. But below this fundamental human pattern of movement, there are more subtle, less predictable traces of movement by non-human participants: birds, insects, cats and at other times of the day, there may be foxes, rodents, squirrels and other creatures. Then there are the trajectories of wind blown leaves and litter, shadows from lampposts moving with the sun. The performance space is illuminated by the afternoon sun, but I look for the streetlights and reflect on how the feel of this constructed space will change dramatically under lighting. With Armistice Day the following day, we walked to our “tree of consequence” via war memorials. Like the previous walk 43, this score had a number of options for groups, pairs or individuals. We opted just for the shadow and light score in which I stuck to the shadows and Blake headed for the light. This became quite challenging as, in our respective places, the weather alternated between sun and rain showers. So we needed to be more creative about what were light and shade. Keeping to the shadows altered my spatial awareness on the walk a lot more than I expected just from reading the score. I was constantly aware of the sun and the weather conditions, the orientation of streets, the heights and positioning of the objects/buildings en route, whilst attempting to navigate towards a destination. The location of light/shadows caused me to divert on a more circuitous route quite often. The nature of keeping to the shadows meant that I sought out narrow, confined and quieter spaces, so in fact, I did in a way complete two other parts of the walk 45 score i.e I became more agoraphobic shying away from open, well lit spaces, and my destination is actually positioned in the quietest part of the town. Also I was forced into walking differently, crouching, slinking along walls etc – it certainly felt like a performance. As for future performative possibilities, I began to think about how the route of my walk could change at different times of the day and even at different times of the year. A midday walk in Summer might offer very little shadow, whilst the sunny late afternoons of Autumn and Winter offer greater freedoms. So thinking of a destination, keeping to the shadows and noticing how the route and way of walking changes at different times of the day or year could be one possibility. I also began to think about how being in the shadows felt colder. Certain areas of the town can “feel” warm (perhaps because they are more sociable spaces or near places like pubs, libraries, theatres, bakeries, cafes) or cold (because they are more austere like churchyards, banks, characterless offices and bus stations) so perhaps another score might be to walk noticing the temperature gradients, perhaps keeping to the warm or cold zones, or starting from a cold place attempt to navigate along a gradient of increasing temperature. 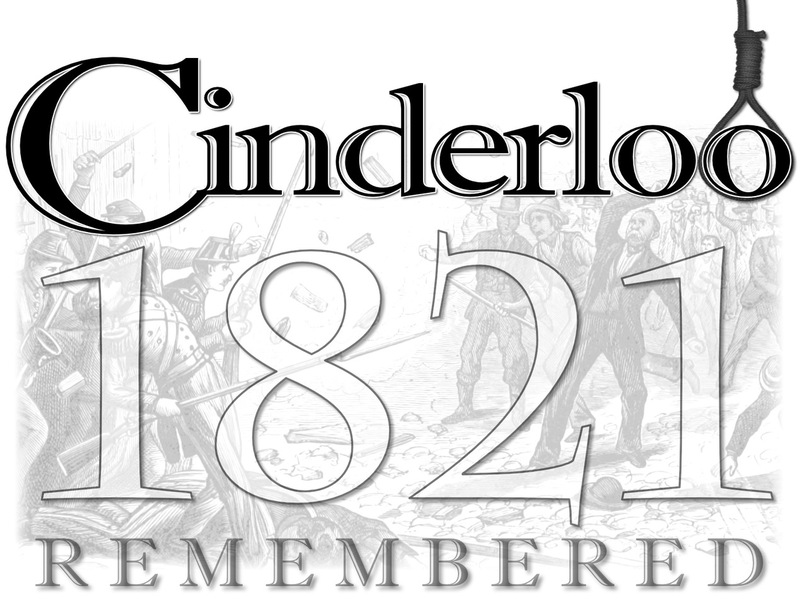 As I wrote in an earlier post, for just over 12 months now, I’ve been exploring ideas and working with many different people in and around Dawley, Telford, to begin running events to commemorate and raise awareness of the Cinderloo Uprising of 1821. We’ve come a long way, generated a lot of interest and support, and begun to attract funding to support initial activities. I’ve helped set up a website for the community organisation Cinderloo1821, which will bring together historical information, contemporary responses, writings and artwork about the 1821 Uprising. We await news of an initial application to the Heritage Lottery Fund for a grant that will support plans for a range of different activities including intergenerational workshops, educational work with schools, walks, heritage skills workshops, local history and family history research. Meanwhile, I’ve been walking and discovering the immense network of tracks, woodland and history which binds together the various communities across Telford; sometimes with new found friends interested in the project, and sometimes alone. These walks have helped develop various ideas for art projects associated with Cinderloo. Do we have a witness? Who planned and plotted and schemed? That continued to burn in their hearts? Much of the history bound up in the old towns was swept away or obscured with the development of the new town of Telford (currently celebrating its 50th year). Yet there is much remaining, and the history of the town is much more than that presented in the Ironbridge Gorge and Coalbrookdale. But perhaps, some of the most interesting, enigmatic features which connect the landscape of today with the historical landscape of 1821 are trees. I was drawn to the notion that some of those, that are now over 200 years old, may have witnessed the events of Cinderloo, for which we now only have newspaper reports to rely on. I have been in conversation with Shropshire Wildlife Trust, the Small Woods Association and members of Severn Gorge Countryside Trust to trace and map trees which are thought to be over 200 years old. A group of us are also tracing the old miners tracks, many of which still exist and which may have been used by protesters on that day in February 1821. It would be great if other people wanted to walk these routes for themselves and find their own trees to add to the map. We would also welcome any photographs or other artworks inspired by these trees. Contact me directly or Cinderloo1821. I have begun making drawings of some of the trees that I have found so far. I am using materials that relate to this landscape and the historical events. So I made my own oak gall ink, using the tannin from acorn galls and ferric sulphate from rusty nails. This ink was used for centuries in historic documents, and has beautiful purply, brown hues, which darken as the ink oxidises. Iron oxide pigment has a deep rich red colour, evocative of the blood shed and, along with charcoal, symbolic of the iron and coal industries which were at the root of the miners’ protest. I have also made a couple of drawings using silver ink on dark grey paper. Again suggestive of iron and coal. I’m not so sure about these yet. I liked how the drawing emerges as light reflects from the ink marks, but light conditions need to be considered very carefully since the drawing is near invisible in most situations. 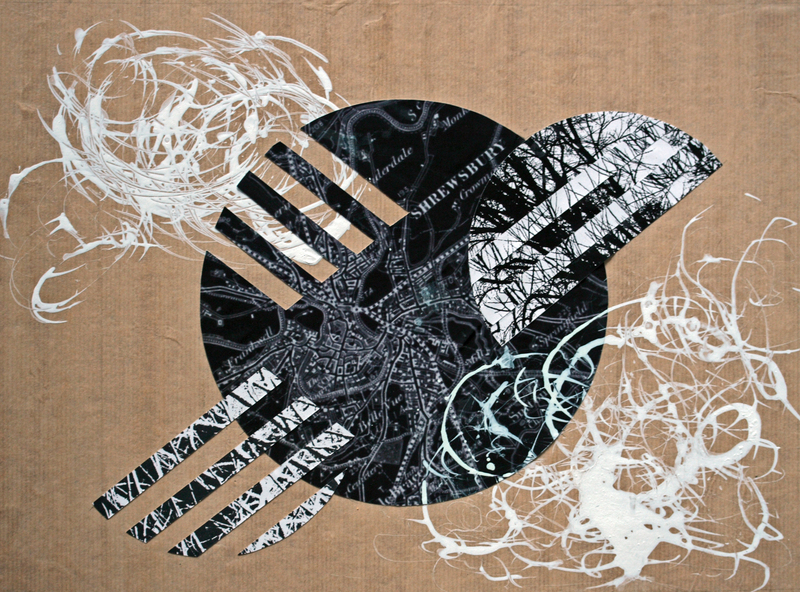 I’m also experimenting with mark-making using brushes hand made with sticks, birch twigs and plant fibres. Look out for more drawings as we find more 200 year old trees. My final “Encounter” was with writer/artist/performer/psychogeographer/life model Ursula Troche and our work began before Ted Eames launched the project. I met Ursula briefly at the World Congress of Psychogeography at the University of Huddersfield last September, and started reading her blog shortly after. I liked her wide-ranging perspective on experiences often derived from walking, and how she combined fresh instinctive responses with careful research to build interesting pieces on subjects ranging from mining and pit-closures to mapping to women’s rights to train journeys and so on. We struck up a dialogue and began discussing a project on the theme of borders and boundaries. Ursula grew up in Germany, and although she has lived in the UK for a long time, she is aware of an unseen “border” between herself and people she meets in this country, which perhaps allows her a slightly different, objective perspective on what she finds in the UK. I was moved by her poem “Circular Ritual Insight” – simple ideas about migration/immigration and regretting a loss of humanity and kinship, but sincerely written with an insistent repetition that is hard to ignore. This became a clear starting point for me to respond to once we began considering taking part in the Encounters project. Meanwhile, Ursula was busy writing poems in response to some of the artwork she saw on my website. This began with my Traces series from the In Parallel exhibition and she also responded to one of my mixed media collages from the In Parallel and Entwined book I made last year. Circles and lines interest Ursula and she finds connections with these forms and subjects that she is investigating. So for example, my works incorporating maps and landscape features of Shrewsbury, drew attention to the river loops around the town and adjacent Frankwell, and the line of flow of the River Severn. The poem Circle World takes a wider view considering what is needed for more harmonious global relationships. There is a link back into Circle Ritual Insight too. As a further reflection on the holding of hands, I recalled my series of works about the relations between successive family generations in my exhibition Imperfectly Natural. This piece seemed to tie in with the poem, as it considers how despite strong parental bonds, we are all alone in the world and must forge new bonds and make friendships with our fellow humans. Hands, of course, are how we begin to feel and explore the world from a young age. Working with Ursula is very easy going, with lots of ideas flowing. As with both Kate Innes and Paul Baines, it is great to find themes and beliefs in common that can feed into new art works. I’m looking forward to continuing with our borders and boundaries work. For the second of my Encounters, I was delighted to be paired up with Paul Baines, since I had enjoyed seeing his exhibition of paintings and artist books at Shrewsbury’s Gateway Gallery 3 a year or so ago, and I had been looking for an opportunity to make contact to discuss his work further. Paul’s early work was inspired by Pop Art and work from the 1950s/60s, but in recent years he has turned to a fully abstract painting style. He has developed a form of visual communication that is founded on ten Projects that express his own ideology and political beliefs. His books combine poems with graphic designs, sketches and drawings. “Empathy with society’s disadvantaged” is a primary driver behind his work. I was intrigued by how such passionately held beliefs could be expressed using pure abstract forms. Paul quickly explained how he has developed a visual language that is inspired by whichever of the ten projects he is focusing on, and after some closer looking at the work, I began to be able to read some of the “vocabulary”. Everyone has their own experience, memories and thoughts about what this means to them. We also have an understanding of what terms are by what they are not. These references are in constant flux as experiences change and things redefine themselves, which I guess is a post-structuralist way of looking at things. So I saw Paul’s paintings as a way of taking definitions back to that moment when inchoate thoughts emerge in response to perceptions from the world, and when, thereafter, terms become defined within our mind. The poem I wrote first was in direct response to Paul’s Project 1 “to promote empathy and compassion” which he was able to translate into a painting. The second poem proved more difficult. Although, both Paul and I had existing work to respond to, all of our work for the exhibition was created afresh in collaboration. We met just once but maintained a conversation by various messages. 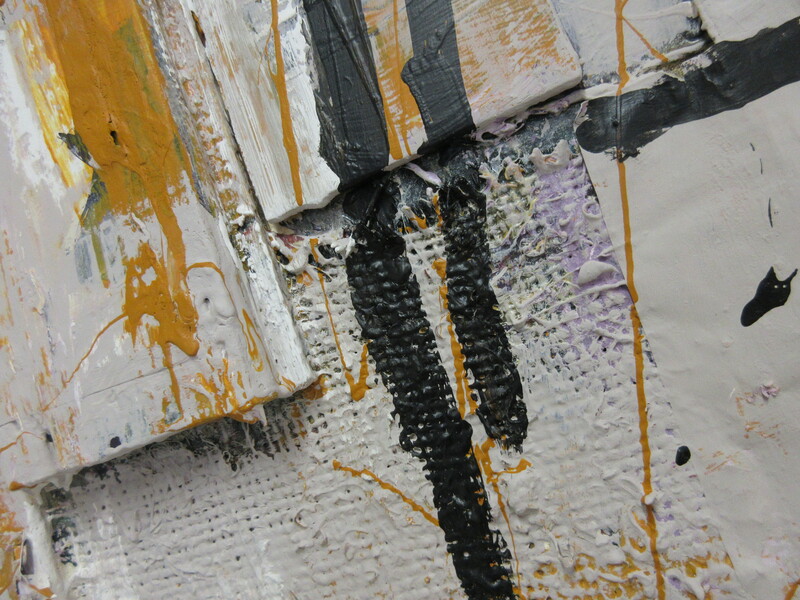 I saw digital images of the paintings not quite realising just how textural they were. My attempts to write something in response to one of the other Projects that Paul has defined did not flow well, and so instead I drafted something which described observations from an urban walk, and which tried to capture a spirit of being in tune with the Projects. Its about acceptance; acceptance of the passing of time and experiences. Nothing matters and everything matters. And before we, as individuals and as societies, attribute values to things influenced by memory and abstractions, there is a beginning. The beginning is the moment. In that moment, she, he, this or they merit the same attention and respect as her, him, that or them. It is up to us, then, to defer, delay, suspend or change the process of valuation to allow for alternative meanings and interpretation. At me or with me? The paintings are powerful and work extremely well in this gallery setting. It was a delight to meet Paul and I hope to maintain our conversations in the future. In my post about collaborations, I mentioned that I have been working with three other writers/artists to make work for an exhibition called Encounters that opened this week at the VAN Street Gallery in Shoplatch, Shrewsbury. The project was the idea of Ted Eames, and it brings together over 20 pairings of visual artists and writers, one artist making work in response to the other’s work. There have been similar such collaborations in the past, but rarely in such numbers I suspect. Having been involved in the installation of the exhibition, I had a chance for a brief preview. I am fascinated by the diversity of work produced, and can’t wait to go back to spend more time absorbing it. 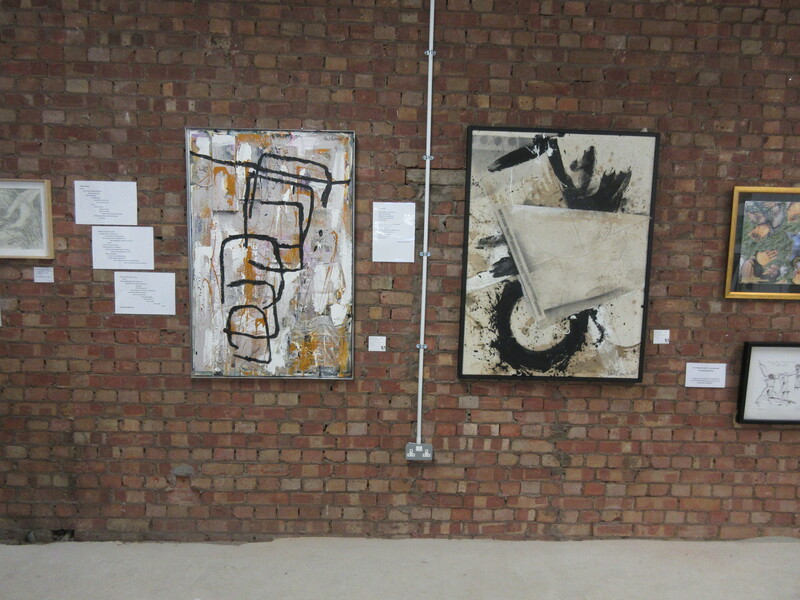 My own work comprises six paintings and collages with Kate Innes and Ursula Troche, and two poems with Paul Baines. Perhaps on first viewing it appears quite diverse/eclectic, but there is a common theme which links everything, although this may not be immediately obvious. In this first of three posts, I will discuss the work made with Kate Innes. Of the three pairings, the work with Kate involved the most discussion and interaction in the development of each piece of work. We found many common interests and a similar sensitivity to the landscape and the human history within it. Kate is a published poet (Flock of Words) and novelist (The Errant Hours). She writes beautifully about the rural landscape, with a knowledgeable eye for the detail of flora, fauna, and geology. There is also a historical/mythical content to her work which clearly links with her background in archaeology and in museum education. 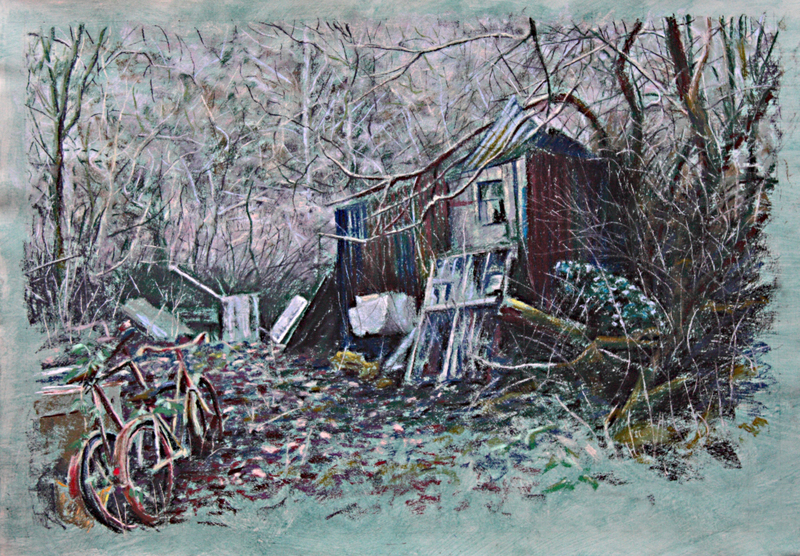 My drawings of abandoned dwellings/cabins were an initial starting point of interest, and in particular, the curious dilapidated structure which I had found whilst walking near Shelton on the outskirts of Shrewsbury. Kate, too went on foot to visit the place, and like me was drawn to the atmosphere of this small patch of woodland high above the River Severn which can be glimpsed through the trees. A group of people have been using the area as a gathering place and trees are marked with paint, bits of fabric and plastic, like totems. It felt tribal or ceremonial, like an ancient sacred site. We discussed our responses to these enigmatic isolated and empty structures set in woodland, and explored some of the issues raised in my earlier post around Bachelard’s “Poetics of Space”, the temptations of the “hermit’s hut”, refuge/retreat, and the negotiations that must take place when two people take up residence. The titles of my trio of drawings “When Adam delved”, “And Eve Span” and “Who was then the Gentleman” struck a chord with Kate, referring to John Ball’s speeches that helped inspire the Peasant’s Revolt of 1381. These words relating to equality and social justice resonated. I can see flaws that niggle, but in general I’m pleased with the brooding feel to the paintings. 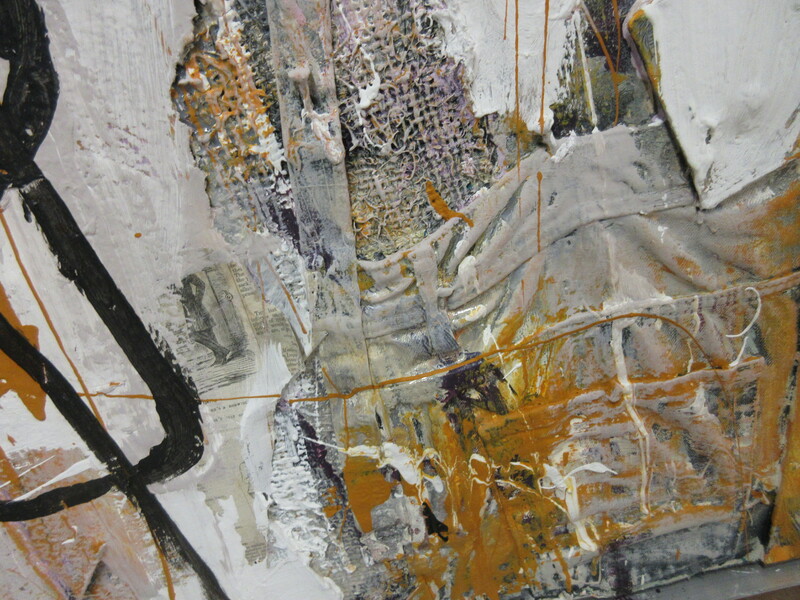 There is just enough rawness, texture and painterliness in the markmaking. The brief period for the collaboration (around 3 months) encouraged a disciplined approach and a need for some risk taking. Kate crafted a poem entitled “Adam’s Return” which responds to Shelter, and also to the trio of drawings, referred to above. To close this short narrative, she drafted a third poem specifically in response to “And Eve Span”. The sparse, measured style and ambiguous timing or timelessness of the poems’ positioning is, for me, reminiscent of the novelist Jim Crace, or perhaps more distantly Cormac McCarthy. It was a privilege to see how subtle changes in wording in the few iterative drafts enhanced the poems, shifting emphasis, refining rhythm, suggesting alternative perspectives, picking up on certain aspects of the paintings. The three poems expand meaning and add greater depth to the paintings, and it was a pleasure to be a part of it. For some months now, I’ve been working with Ted Eames, Pete Jackson, Jill Impey and a growing number of enthusiastic people in and around Dawley, Telford on the development of a community project to commemorate the Cinderloo Uprising of 1821. This dramatic event took place on 2 February 1821 at the cinder hills in Old Park, adjacent to what was the ironworks of Thomas Botfield, now occupied by the Forge retail park at Telford town centre. A confrontation between over 3,000 striking miners and the Shropshire Yeomanry left two men dead, many injuries on both sides and following arrests, one man, Thomas Palin, was hung in April 1821 for ‘felonious riot’. It has become known as ‘The Battle of Cinderloo’ or Cinderloo Riot. Read more. I was surprised to learn about the historic event only last year, but discovered that many local people were similarly unaware of it. Following some research, I found the excellent Dawley Heritage website which did much work to bring this event and many other aspects of Dawley’s history to public attention. There is a great opportunity to help start some activities to engage people and commemorate Cinderloo up to the 200th anniversary in 2021 so I began to get in contact with local historians and other interested groups. Its been inspirational to meet so many enthusiastic and knowledgeable people who share a similar ambition to broaden recognition of this key event in Dawley and Telford’s history. With my own artistic interest in how people interact with places, there are many aspects to be explored around mining and metals industrial heritage, physical changes in landscape and environment, political and social history, the influence of Non-Conformism and Methodism, social conditions, workers’ rights and social justice. There are connections with contemporary issues, and it would be great to be able to use creative activities in intergenerational events, and in educational programmes with schools, colleges and community groups to build in work established by the Dawley Heritage project and the Heritage Schools programme set up with Historic England. I have been making a few walks of the area to get a more detailed understanding of the geography, which has many layers of historical development revealing clues to its past. It is hard to imagine how different the area would have looked 200 years ago when there were many mineworkings, spoil heaps, ironworks and other industries, and scatterings of dwellings and religious buildings. The landscape today continues to evolve quite dramatically as brownfield land is reclaimed. This combination of dynamism and link to the past must have an impact on the sense of place for people living here. There are over a dozen Methodist, Primitive or Wesleyan chapels in the area, mostly built after Cinderloo and some are now converted to residential homes. Over the last 12 years or so, I’ve taken part in several artistic collaborations, which have tended to flow alongside what I viewed as my main solo art practice. This year, and, as I look ahead into next year, most of my time seems to be working on new projects with a range of artists and other people. So my practice is transforming. Working in teams, large and small, is integral to my experience as engineer/environmental consultant, but it has been a fairly slow realisation that collaboration is something I thrive on in an artistic sense. Most artists collaborate at some point in their career, and there are famous examples like Warhol/Basquiat, Rauschenberg/Johns, Rauschenberg/Cunningham, Krasner/Pollock, Bunuel/Dali, Richter/Palermo, Abramovic/Ulay, Kahlo/Rivera and so on. The work of some artists like Gilbert and George or Jake and Dinos Chapman is almost entirely one of collaboration such that the individual practices are indistinguishable. One of my favourite collaborative partnerships is that between Janet Cardiff and George Bures Miller, which has produced some fascinating, mysterious installations and audio-visual works. The artists can define their own “rules” or guidelines. Sometimes, each artist produces their own work in response to a common theme, and the results are shown together. Other artists work progressively or iteratively, each producing their own pieces but in direct response to the other artist. This might depend on whether the two artists work in similar media or whether they take entirely different approaches. 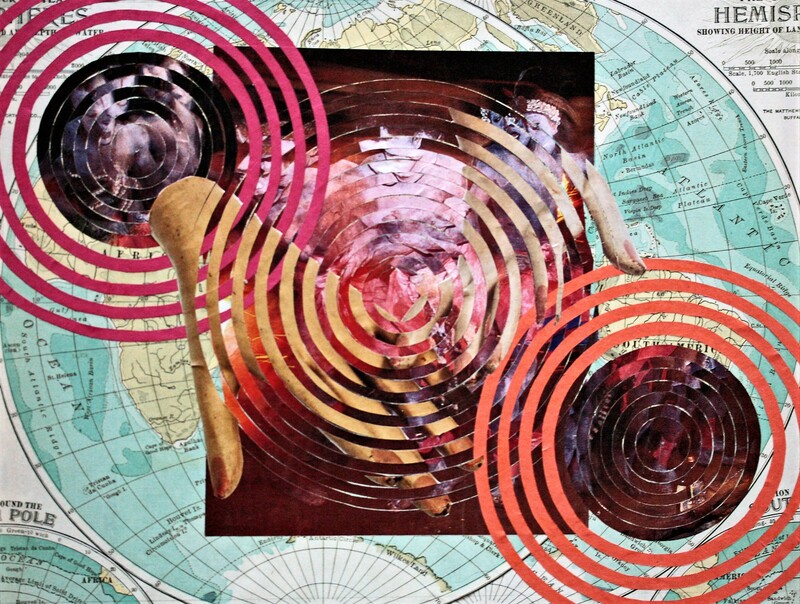 Collaborations in which both artists work together to produce works that combine both their inputs can be very interesting because this often means that both artists have to move out of their comfort zone, take risks and negotiate. That negotiation can be challenging. Each artist’s work is usually a very personal expression, and so the collaborator gets to know the other artist and gains a little understanding of how they operate. One or both might feel that they must compromise in aligning input towards common goals. 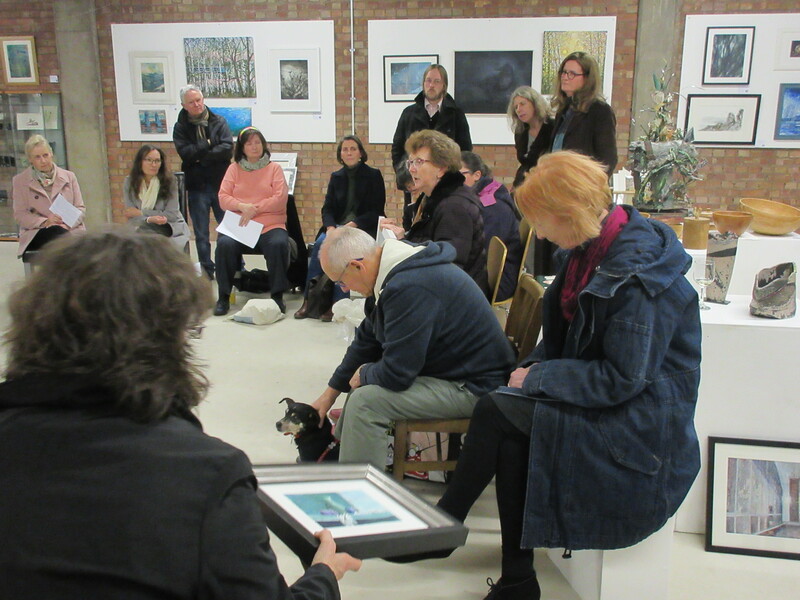 For me, this is a stimulating environment because sharing work is when your art comes alive, open to response, re-evaluation, new interpretation. Sharing with a public audience is important too, but sharing in a supportive space with a “critical friend” enables me to investigate work within a constructive dialogue. It gives the work a sense of purpose that is difficult to achieve working alone. 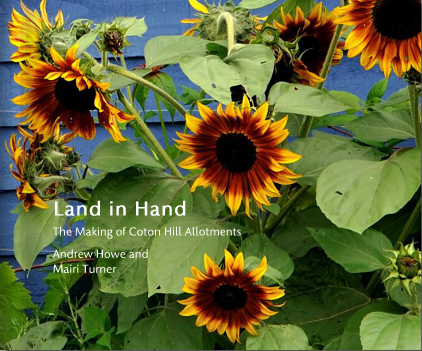 Two of the collaborations I have been involved with in the past included the Cloud Gallery collective and my joint commission with Mairi Turner to document the development of new allotments at Coton Hill. I enjoyed both collaborations. At the time with the Cloud Gallery, in 2007, I was probably the least experienced artist in a group of 6 artists/Cloud Gazers yet all “team members” played a key role in delivering projects which included an eco-architecture camping weekend, a sculpture/installation and artist walk as part of the Greenhouse Shropshire exhibition in 2008. Individual inputs were often fairly indistinguishable within the final output. And it felt to me, that the synergy of all the artists enabled us to produce work that we may never have made as individuals. My work with Mairi Turner also had a valuable sharing of insight, experience and skills. In this case, though, each of us documented the project using photography in our own individual way without meeting on the site itself. Our work was then combined together in a book and in an exhibition. “…a collaborative art practice of walking together, merging experiencing, making, presenting, and social engagement. Our walks have become a platform to share ideas and make new work, providing not only motivation but also a safe space to explore themes of memory, space and spirituality, while being inspired by weather, light and the landscape. The value of this relationship is huge. To be an artist is a predominantly solitary activity; to be able to have support and be supported gives great strength. Our combined experiences, thoughts and connections enhance greatly what might have been done individually. The collaboration is pushing us both to be more courageous and move out of our comfort zones. Over the last 5-6 months or so, I have been working with artist/poet Emily Wilkinson on a couple of different ventures. The first of these, involving walking with a groups of people to gather inspiration for creative writing and making collages, led to some pilot workshops during the November (Read more here on walking/writing and collage). During this time we also partnered with artists Ted Eames and Jamila Walker to form a new collective, called we are Here Here! aiming at collaborative, socially-engaged and participatory projects about place and community. A second project with Emily involved exploring creative responses to a privately owned “secret woodland” in Shrewsbury, or as we termed it: a dappled glade. We made work individually and in response to each other’s work. The woodland itself was quite neglected with a fair amount of fly-tipped material, overgrown scrub and ivy. We decided to start a clean up of the woodland to make a small but tangible positive impact on a place that we felt a connection with. Neighbouring landowners are generally in support of what we started and we might, perhaps, achieve something with a sustainable future in that community. It remains to be seen whether Emily and I can capture some of our creative responses and work in the woodland in some finished pieces of art. I have recently started developing ideas and a scope for a very exciting project with Gareth Jones, an artist/academic based in Osaka, Japan. The project will research experiences of walking in virtual spaces and real walks in our respective locations. I have been accepted onto an international arts collaboration exchange which could lead to some very interesting work about place, and opening out to new audiences. I’m just awaiting to hear further details about that. Its early days to predict what, if anything, might emerge from these collaborations. But then that is the exciting part of it – we have to work together to make it happen.